I am a masters student interested in prehistoric complex societies of the American Southeast. My research focuses on using non-destructive spectrographic analyses methods, such as XRF, on historic Choctaw ceramics from Mississippi. 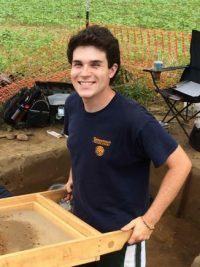 I first became interested in anthropology at Wake Forest University when I took an introduction to archaeology course. Soon afterwards, I found myself volunteering in my professor’s lab washing artifacts! I am very excited to be working at the University of Alabama. Roll Tide!